HUNDREDS OF RESCUERS were trying today to save 12 children and their football coach from a flooded cave in northern Thailand, where they have been trapped for two days amid heavy rain and dwindling food supplies. Divers found bicycles, shoes and footprints in the five kilometre-long Tham Luang cave, where the youngsters’ football team and their coach have been trapped since Saturday. “We are surveying the areas around the mountain and will try to find another exit or entrance,” Chaing Rai provincial governor Narongsak Osottanakorn told AFP, adding that hundreds of officials have been sent to help with the rescue. But one expert who has studied the cave for the past six years told officials there was only a single entrance, which is now blocked by water. The team, aged between 11 and 16, went into the cave after football training on Saturday. One of their mothers raised the alarm when her son failed to return home. Narongsak said rescue operations would continue overnight and teams were on standby with supplies for the trapped children. “We’ve preparing everything, water pumps in case the water is still high when we find them and food and drink,” he said. Light rain fell in the area today and was expected to continue into tomorrow. 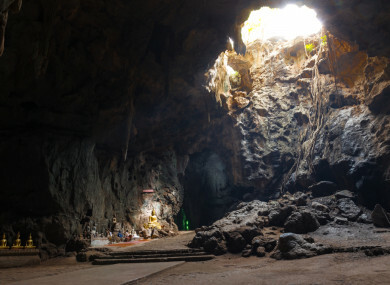 The Tham Luang cave is not widely popular among tourists because of its remote location, though locals visit to view small Buddha statues inside. Thailand’s monsoon season from May to October routinely causes flooding and landslides. At least 30 people were killed in major floods in January 2017 in southern Thailand, as overland routes were cut off after heavy downpours. Email “12 children and their football coach trapped for two days in flooded Thai cave”. Feedback on “12 children and their football coach trapped for two days in flooded Thai cave”.